You pop in some leftovers, press the 30-second button, and voila—a hot meal! Microwaves are a wonder, but would you believe they were accidentally invented by scientists working on top-secret war equipment? During World War II in Great Britain, John Randall and H.A.H. Boots were working on ways to make radar better. They wanted to make a highly accurate radar that could be carried aboard aircraft. This radar could help pilots detect and destroy enemy planes and submarines at night. After the war, Dr. Percy Spencer, an engineer at Raytheon was experimenting with the magnetron. He noticed that it warmed things around it. He wondered if it would heat food. Spencer placed some kernels of popcorn near it and was astounded to find that they popped. An egg exploded when placed near it. Spencer made a crude metal box into which he fed the microwaves (the magnetron works by creating “microwaves,” which are high-frequency electromagnetic waves). He continued to fine-tune his invention. The first commercial microwave was tested in 1946 in a restaurant in Boston. A year later, the first microwaves appeared on the market. They cost $5,000 and weighed over 750 pounds. It took several years of trial and error to get the microwave right, but by 1976, 60 percent of American families owned one. Today, that number is close to 100 percent. We can’t imagine living without one. Answer: When electromagnetic waves enter food, they cause it to vibrate and heat up. These waves could potentially cause the same effect in the human body. 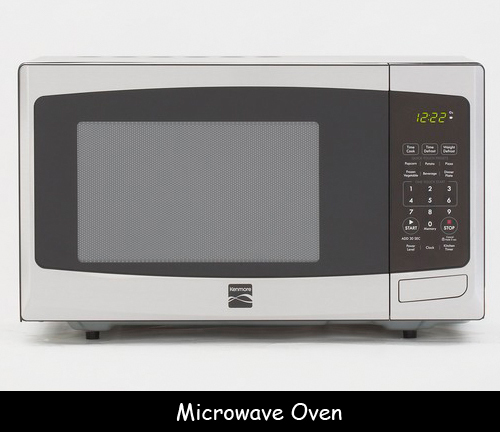 Modern microwave ovens are sealed so that microwaves can’t leak out; still, it’s a good idea to make sure your microwave is in good working condition. A more likely danger is that of burns, since microwaves heat food very quickly. Be sure to use oven mitts when removing food from a microwave oven, just as you would a traditional oven.